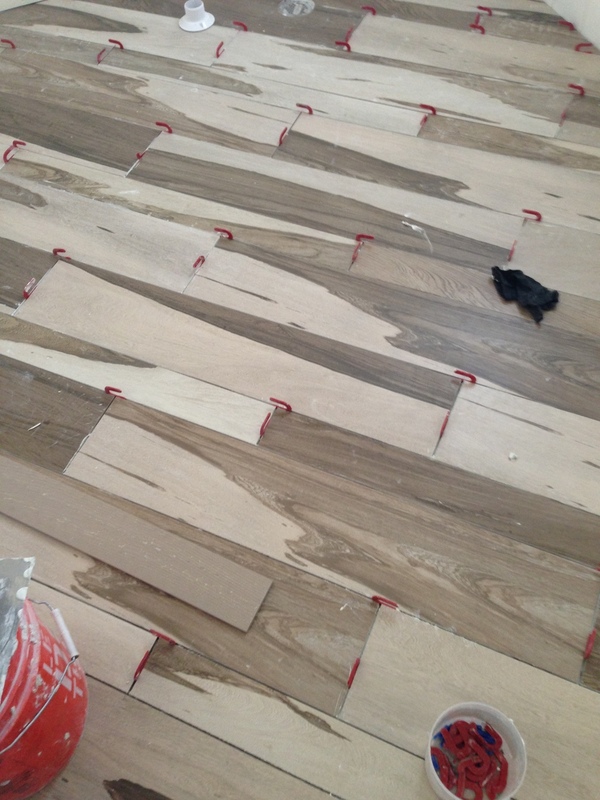 Here's the Arizona wood tile in the laundry room. The newest wood pattern tiles are extraordinary and we're using them liberally in wet areas like the mud room, laundry room, showers and bathrooms where we don't want to use real wood. Here's the tile being laid in the laundry room. It's Arizona tile called Over Creme and it comes in kind of a brown feel (this one) as well as a kind of black and white look that we opted for in the mud room. Arizona tile has been booming since they have the best looking and most dramatic wood tiles. Their success has led to a lot of innovation in this area and the other manufactures wood looking tile products are now getting a lot better. So, if the Arizona wood tile is out of your budget, take a look around and you'll certainly be able to find some good product.